Jackery Bar is the smallest portable external battery with 2.1A output designed for extending mobile device battery life. It includes a high-energy density, fast-charging, compact design, and smart safety protection circuit. Jackery delivers beautiful design at affordable prices along with great customer service. The Jackery Bar is often used with leading smartphones and tablets like Samsung Galaxy, Apple iPhone, Apple iPad, and more. 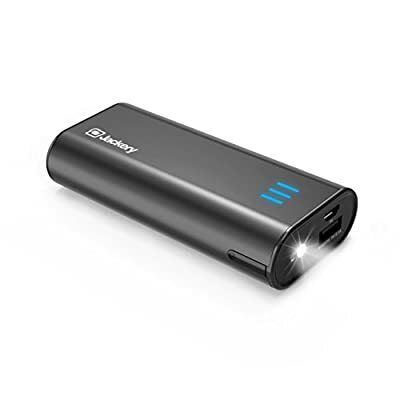 Jackery Bar Performance for iPhones: 200%-300% battery life, Input: 5V/1A, Input charging time: 6-8h via Standard USB or AC adapter (not included); Output: 5V/2.1A; Compact Size: 3.8 x 1.8 x 0.9 inches; Weight: 5.5 ounce; 18- month warranty. TRAVEL BATTERY CHARGER: Perfect portable travel charger for long flights, road trips, or whenever you need to charge your iPhone, iPad, and other smart devices. SMARTPHONES & TABLETS: Battery charger and power bank adds 2-3 full charges to your iPhone and 1-2 full charges to Samsung Galaxy. COMPACT PORTABLE CHARGER: External battery travel charger is stylish and compact to easily fit into your bag to provide instant power to smartphones and tablets. ADVANCED TECHNOLOGY: High-capacity battery pack and portable phone charger with 6000mAh battery capacity for iPhones, iPads, and Android devices. POWERFUL BATTERY PACK: Panasonic grade A Li-ion polymer cell and premium microchips combined into a premium aluminum case to create a high-quality and powerful portable battery charger.